While visiting Hampden Park, I took the opportunity to pay homage to the old Hampden Park, Cathkin Park; the former home of long lost Scottish club Third Lanark. Originally the home of Queens Park, it staged it’s first game back in 1884, and went on to host Scottish Cup Finals as well as internationals. When the club moved to the site of the present Hampden, it was then renamed New Cathkin Park and taking over by Third Lanark. 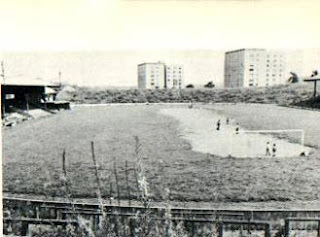 The last game played on the old ground was in 1967, just before Third Lanark were wound up in the courts, the site was developed into an open access park by the Glasgow parks department. The park still preserves sections of the original terraces, crash barriers, as well as parts of the perimeter wall. The park still has a nostalgic feel about it, even though the days of first class football are long gone, it’s a former historical venue well worth visiting if your ever in the vicinity.